The trend of 90’s comeback with innovative patterns that can be seen in ruffled sarees as slight twists in traditional sarees. There is no restriction to keep continuing experiments in the world of fashion. Fashion designers ubiquitous distinctive collections along with unique adornments. Ruffles are an example of an old trend with styles that can be seen on Instagram, Facebook, Pinterest, Fashion Magazines, and other social media channels. Even ruffles can be seen on Bollywood and Tollywood screen. A ruffle touch gives feminine look. Recently, not only ruffles can be seen over all the outfits but also at the bottom of the skirt, few parts of saree or sides of dupatta. Basically, there are two types of ruffles: (1) Circular Ruffles (2) Gathered Ruffles. Both ruffles give thrilling appearance but circular is most popular. Be wise to opt ruffles with contrasting/matching colors and horizontally or vertically. Huge varieties can be seen in various shapes and size of ruffles but selection can be influenced by the outcome that you require. 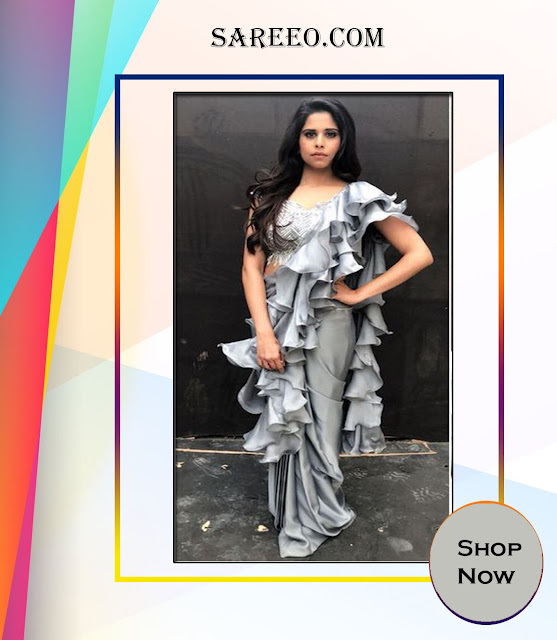 Furthermore, asymmetrical ruffles are the latest trend especially one shoulder blouse/top with ruffles across neckline as it offers architectonic glance. Attire with extreme flared looks attractive and feminine. Who doesn’t want to be stylish? What is a better way to appear flawless and attractive than dress in ruffle style? This modish style can be implemented mostly on smooth fabric and suits on slender bodies. Flexibilities are that you can opt size of ruffles as per your choice and that makes a considerable difference in appearance. Select the right design and pattern to acquire confidence! Here are some designs, old with contemporizing form are revived by designers. Crafted in splendid chiffon light sandstone ruffle saree comes with net embroidery blouse. Stylish designer embroidery worked blouse is obviously fanatic. Drape it from the front and take it in back to show more ruffles and dramatic look. 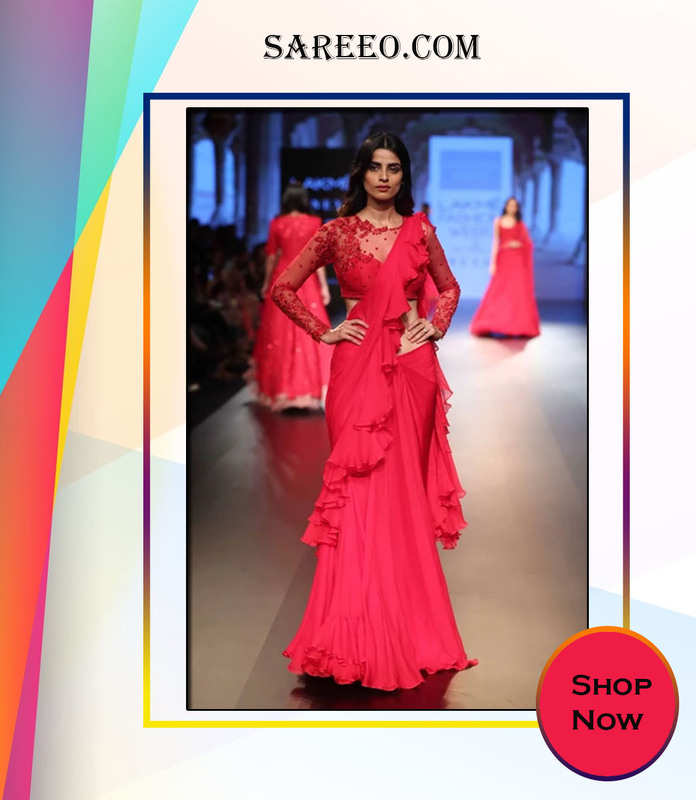 A dressmaker has designed red color ruffled border chiffon saree for date night. It is combined with net embroidery worked full neck blouse with long sleeves. Sheerness of the blouse provides hot appearance. This saree suits on a slim body and fairy/peachy tones. In the world of fashion, designers introduce innovative designs in each season. 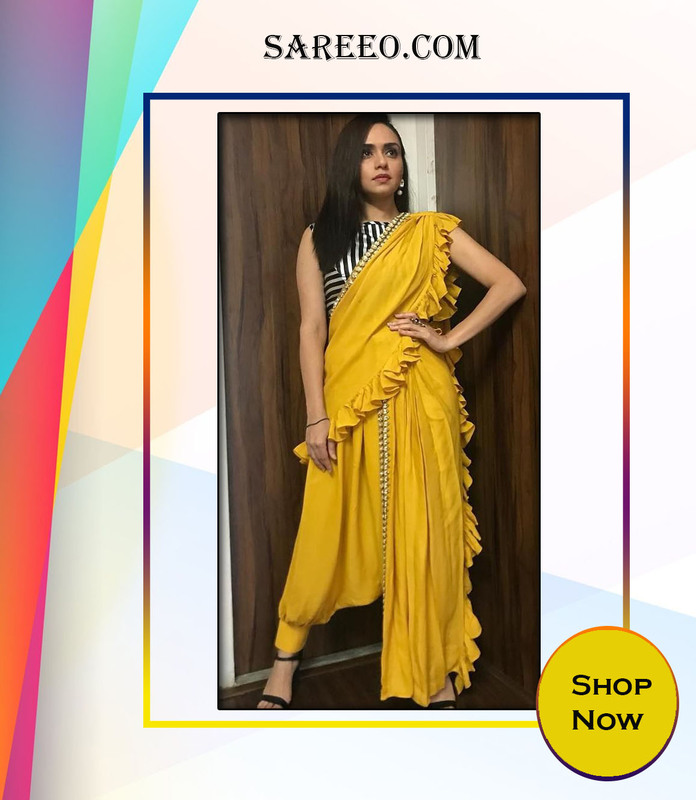 Here, is yellow colored frill fusion voguish saree that specially designed for cocktail parties. You can team up either with yellow or black stripes pattern sleeveless blouse. Those are interested in unique and modern sarees, dhoti saree is a good option. In a competitive world, to stand up in the queue of stylish ladies is necessary. Pick up right attires for functions such as gathering or night parties and wear the best out of your wardrobe. 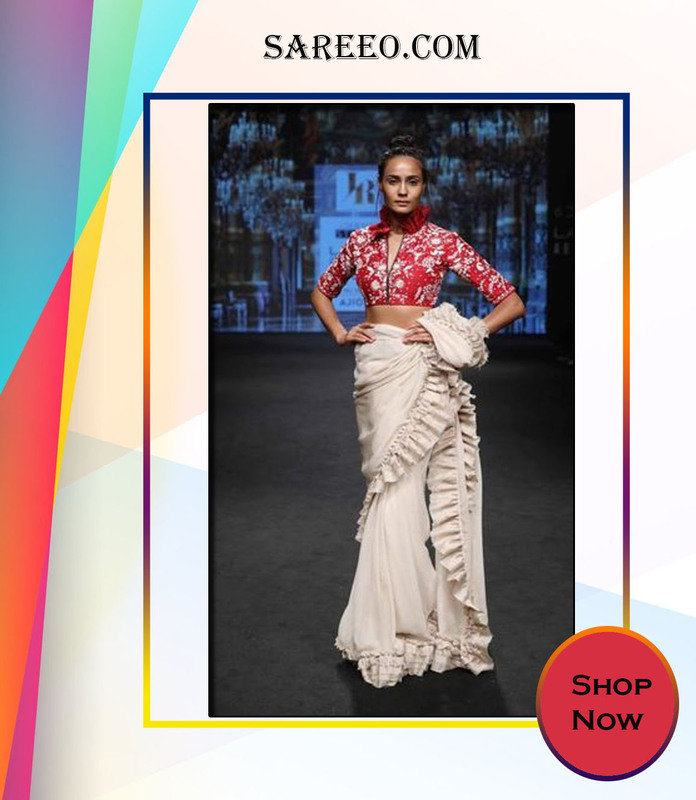 Flexibilities of this multilayered ruffle saree are required minimum accessories. Adoption of the variant blouse is beneficial. If you’re looking for a mixture of light – bright shades, green shades are an ideal choice. Sequin worked crafted in net blouse is absolutely remarkable. Slim lady can opt fully flared sarees as it gives high volume. Light green shade suits on pale or yellow color tone mostly. Lightly weighted peach net and narrow bordered saree are exquisite. You can opt boat neck with a net or simply select sweetheart neckline in such a way that shows sober embroidery work. 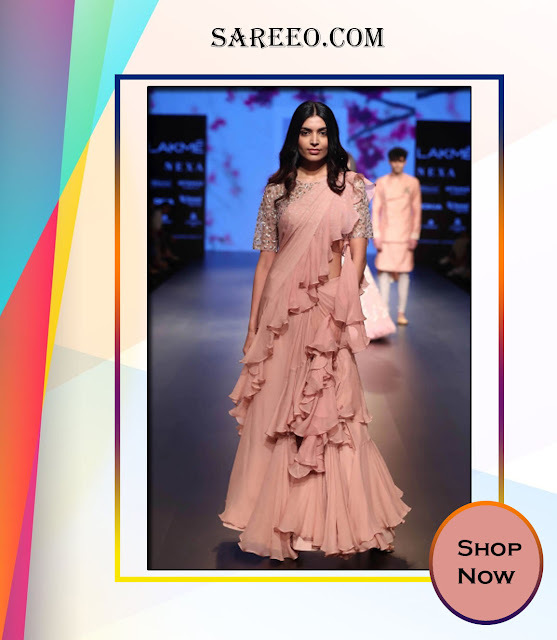 If you’re confused about what to wear at a dinner party, select this peach ruffle saree. In ancient times, ruffled collar dresses were popular to wear and recently, it comes in craze again. Deep V neck with ruffled collar blouse along with plain or printed saree is perfect for gathering functions. If the hem of saree is ruffled, it will add the grace. It is mandatory to choose a relevant blouse with any saree. 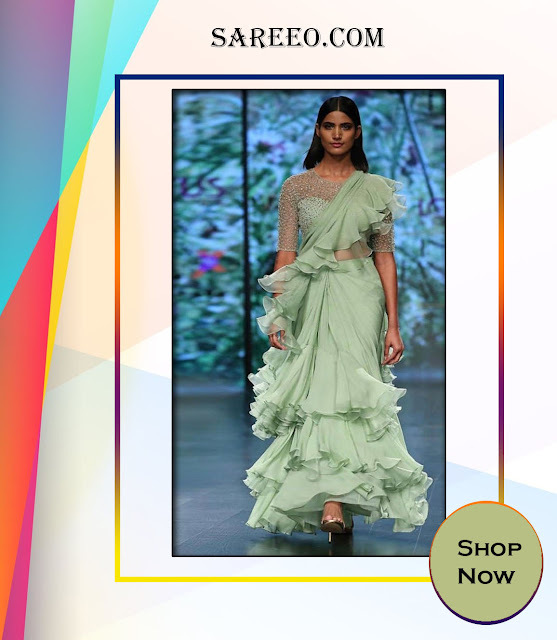 If you don’t want more ruffles but still looking for contemporary designs, decide to take ruffled sleeves blouse with designer saree for an elegant appearance.